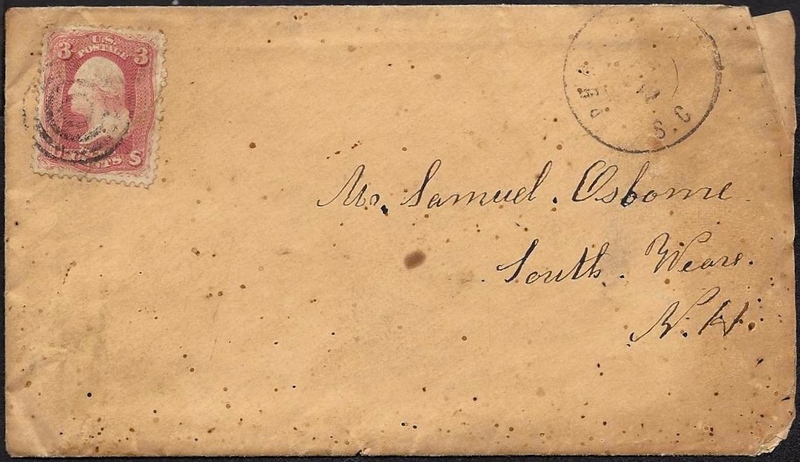 This letter was written by 22 year-old Harvey H. Martin (1840-1863) of Company D, 7th New Hampshire Infantry. Martin was mustered into the service in December 1861 as a private and was promoted to corporal on 14 November 1862. In the 1860 Census, Harvey was residing with, and laboring on the farm of his uncle, Samuel Osborne, in Weare, Hillsborough County, New Hampshire. We know from other letters that Harvey had a brother named Isaac who served in the US Engineer Corp. during the Civil War. 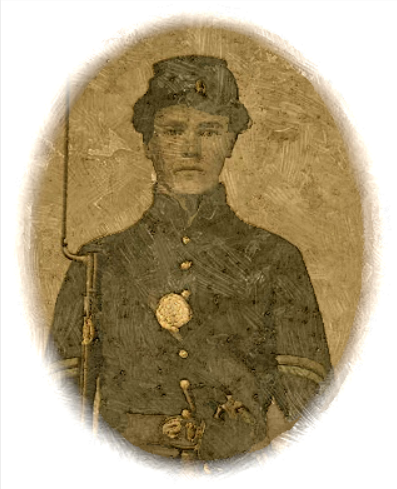 Harvey Martin was killed in the 7th New Hampshire’s assault on Fort Wagner, S.C., on July 18, 1863. Like the more famous 54th Massachusetts led by Col. Robert Shaw before it, the 7th New Hampshire was slaughtered. Those Union soldiers who died in the assault — white and black alike — were buried in a mass grave by the Confederates following the repulse. Have a few leisure moments now, I thought I would improve them by writing to you. We left Fort Jefferson ¹ the sixteenth of June thinking of stopping at Hilton Head or go up to James Island where the Third had a battle a few days ago. We had the good fortune to stop at Port Royal — or sometimes called Hilton Head — over night so we had time to go up on the grounds. We found some of the unfortunate Third [New Hampshire Volunteers] that were wounded in the Battle at James Island [the Battle of Secessionville]. They report it is a very hard battle and the Rebels were superior by a large force. They stated that they [the Rebels] had three batteries. When drove from one, they had a road prepared under ground so they could retreat back to the next battery without being seen so they had all the advantage of our troops. They state there was about one thousand of our men killed and wounded. Now they have ordered our troops off of the island and they are mounting their gun boats and are going to shell them out. They say that the island is so surrounded by gunboats that they cannot get off of the island without being blown up and I wish that none come out alive. Enough of this stuff this time. I stated before that we stopped at Port Royal all night. The next morning we had only to go up to Beaufort about fifteen miles up the Savanna River, being a port of Port Royal. It is supposed to be the pleasantest town of South Carolina and thought to [be] a summer resort of the southern aristocracy. I should think that there must have been three or four thousand on the ___ where the natives were and I don’t know but more. There is a considerable village. The streets are laid out in very good shape. The buildings are not like our northern buildings. A great many of them [are] brick cemented over on the outside. There is some here made of cement and oyster shells mixed together. When dry, [it] makes a hard substance about as hard as iron. Some of the houses are getting old and you can see the oyster ___ out the whole business. There are some very nice homes and very nice gardens in front of them. It was said when the troops first come here, almost every house had a nice piano in it. There was one found. It was said to be worth three thousand dollars. It seems by that the owners were a pretty wealthy set of people having secesh darkees. We have seen some that were waiters for these masters and have had a talk with them. They all seem to be glad to get away from them. There is fifteen or twenty hundred contraband here, I should think — some in the village and some on the plantations. There is almost everything raised here that is raised in any of the southern states. You can buy potatoes, squashes, pumpkins, watermelons, corn, beans, peas. These you can get new and else cheeses, blueberries, huckleberries. In about a month, we shall have oranges, figs, plums, and peaches. On some farms they raise cotton but I have not seen any growing yet but I shall in a few days. There is a great any trees here that grows in the North such as oak, maple, apple, linden, pines, [and] some others that I don’t think of now. I did not state how long we were coming from Fort Jefferson. We started sixteenth and landed the twenty-second. The steamer that we came on was the Ericson — a mail boat and a very fast sail. We stopped at Key West over night and went ashore & bought stuff to eat ____ . We were relieved by two companies of regulars [First U.S. Artillery] which came here with us and also that company from Fort Jefferson came with us which combined together made about thirteen companies on one steamer. There is about two thousand troops here, two companies of cavalry, four companies of artillery, and the companies of the fourth and part of a New York regiment [the 19th NY Vols]. There is five companies in our regiment out on picket. Some of them [Company A & K] went out the first night we get here. Why they have a picket — it is an island and there is a river or a creek runs clear around it. On the mainland right across the river, there is every quantity of rebels. They very often fire across the river at our pickets but don’t ever kill any of them. They try very often to come across but finally get what they deserve. They have tried two or three times since we come. Last night the cavalry were called out double quick and went up to the ferry but they didn’t try to come across. One of our companies was called out too but they came back this morning and said there was not any trouble. One of the boys of the company [Henry Ball of Co. H] shot himself out on picket guard. He went to take something off his gun, the gun fell and struck across something and exploded and shot him right through, killing [him] dead. There was one of Company B also shot by Lieutenant accidentally through the head but will get better. I think I shall have to close now for I think these is enough this time. I must write a few lines about the money. Just before we left Fort Jefferson we were paid off. When I got to Port Royal, I thought I would send it home by Express and I sent it to you for you to do what you think best were it yourself. Do what you are a mind to do. There was enclosed in the envelope sixty-five. ¹ Fort Jefferson was on Garden Key, one of a small number of islands known collectively as the Tortugas Keys off the coast of Florida. This entry was posted on Sunday, October 12th, 2014 at 11:36 pm	and posted in Uncategorized. You can follow any responses to this entry through the RSS 2.0 feed.